"Clients come to me because I help them feel empowered." While at Mintz Levin, Reza received a fellowship to serve as an Assistant District Attorney with the Suffolk County District Attorney’s Office, working out of the West Roxbury Division of the Boston Municipal Court. In this year-long fellowship position, he prosecuted a wide range of criminal offenses and gained valuable in-court and trial experience having tried seventeen cases before a judge or jury, and securing convictions in a majority of his trials before a jury. During law school, Reza was an intern for Chief Justice Shirley Abrahamson of the Wisconsin Supreme Court. He also participated in the Criminal Advocacy Clinic where he helped defend clients in Roxbury District Court. In addition, Reza interned at the Florence Immigrant and Refugee Rights Project in Florence, Arizona where he advised clients about their legal rights during immigration hearings, and at the Directors Guild of America in Los Angeles, California advocating for the rights of film and television directors in their agreements with producers and studios. Reza received his A.B. from the University of Michigan (2002), where he was the school’s SuperFan, the student leader of fans at Michigan sporting events, and the only student in the school’s history, at the time, to be awarded the Outstanding Student Leader and Student Legacy Awards in the same year (2002). He earned his J.D. from Northeastern University School of Law (2008), where he was selected as a teaching fellow for a required first year course. Prior to law school, Reza served as a legislative aide for a United States Senator in Washington, DC. Before joining Breakstone, White & Gluck, Reza spent two years as an improv comedian, writer, and actor in Los Angeles. He graduated from the Upright Citizens Brigade improv training center, was admitted and took classes in their advanced study program, and trained with Miles Stroth, an improv legend. 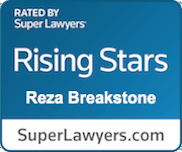 The ability to think quickly on one’s feet is a hallmark trait of an outstanding litigator, and few lawyers have better training than Reza both as a lawyer and performer. Reza is a member of the Massachusetts Academy of Trial Attorneys and the Massachusetts Bar Association. He is admitted to the Massachusetts bar and the District of Massachusetts federal court. He is conversant in Persian (Farsi) and Spanish. U.S. District Court, Dist. of Mass.